CAD Forum - Open just a part of a DWG drawing - layers, views. Open just a part of a DWG drawing - layers, views. In AutoCAD, you can also open a DWG drawing "partially", ie. not load it completely into AutoCAD memory, but load just its relevant part. You can find this function next to the Open button - unfold it with the arrow icon and choose "Partial Open" from the function list. AutoCAD offers a dialog, where you can select which selected (named) view to load and which layers defined in the drawing should be loaded. Optionally you can also unload any xrefs attached to the opened drawing. AutoCAD Map 3D offers also other methods to open (including concurrent open for editing, with entity locking protection) just selected parts of a DWG drawing (region, layers...) - by querying a DWG. Tip 11967: How to apply a changed drawing template (DWT) to existing drawings? Tip 5157: How to transfer a CUI workspace to another PC? Tip 4428: How to open a drawing without loading its Xrefs? Tip 2979: A partially clipped xref has completely disappeared. Selected tip: How to start AutoCAD, not Mechanical Desktop by double-clicking on the DWG? How to start different versions of AutoCAD by double-clicking on the DWG? How to convert an assembly to a multi-body part and vice-versa? 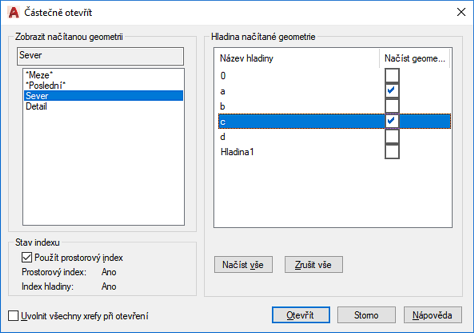 « | » Interactively adjust character spacing in AutoCAD texts.